By Michelle Ducat, Oil Free Wellington. To be published in Fightback’s upcoming Climate Crisis magazine issue. Oil Free Wellington started in late 2012 when the government announced it has granted Texas-based oil giant Anadarko a permit to prospect for oil off Wellington’s coast in the Pegasus Basin. Anadarko had a 25% working interest in BP’s Deep Water Horizon rig, which exploded in the Gulf of Mexico in 2010, killing eleven and causing huge environmental devastation. 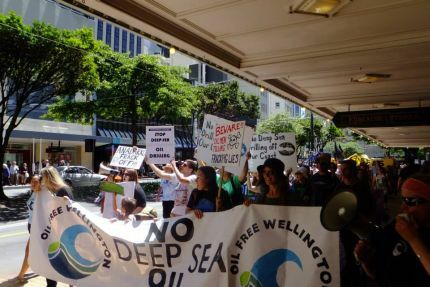 Since then, we have campaigned in Wellington to draw attention to the Block Offer process and granting of licenses to Anadarko, Statoil and Chevron. We have held marches, public talks and film screenings, run email, letter and social media campaigns, dropped banners, and protested on the water, at times using direct action to directly resist the expansion of fossil fuel extraction. Increasingly, we have made climate change and climate justice central to our demands. Many of OFW’s initial members came from a climate justice group that formed after the Camp for Climate Action Aotearoa in 2009, inspired by similar camps in Europe. Climate Camp was held towards the end of the Copenhagen climate talks, and was explicit in its criticism of the whole ‘COP’(Conference of Parties- the UN climate talks) process: if governments wouldn’t address the systemic causes of climate change – the economic system that put profits over the planet – it was up to the people to create the solutions and movement to get that system change. This required acknowledging that those who are most vulnerable to the threat of climate change are those who have contributed least to it. The camp culminated in a day of action targeting the stock exchange. The stock exchange represented the root causes of climate change – and how carbon trading allowed businesses to benefit from climate change. Ten people were arrested for blockading the building. Many environmental groups had held high hopes for Copenhagen to create a binding ambitious agreement. The talks were chaotic and marred by the exclusion of civil society. There was a last minute deal brokered by just five of the countries – US, China, South Africa, Brazil and India – which recognised the scientific case for keeping temperatures to no more that 2 degrees above pre-industrial levels, but made no binding commitments. Vulnerable nations were deeply disappointed that the 1.5 degree target was dropped, guaranteeing their disappearance as sea levels rise. So, eight years later we find ourselves at the eve of another “last, best, chance” – COP 21 in Paris – where once again governments will try to get a legally binding agreement to “prevent dangerous interference with the climate system”. The science has become ever clearer – and the latest IPCC report in 2014 has introduced the concept of a climate budget: to keep a 66% chance of keeping warming under 2 degrees we can put maybe an additional 270 billions of tonnes of carbon in the atmosphere. We already emit 10 billion tonnes a year. This means we can only use between 1/5 and 1/3 of existing oil, gas and coal reserves. Already, the latest iteration of the proposed Paris documents are pointing to a lack of ambition and a lack of focus on the root causes: the long term target and process are still up for negotiation; they barely mention fossil fuels – just mentioning an end to fossil fuel subsidies; there is no mention now of human rights, rights to Mother Earth, civil society, health, gender equity, a just transition for workers, and a Climate Justice tribunal; there is an acknowledgement of loss and damages by vulnerable nations – but with no mention of specific commitments. And although the draft agreement suggests there could be reviews to make these more ambitious, the current tally of voluntary emissions reduction targets – the INDCs (Intended Nationally Determined Contributions) guarantee a huge overshoot of the 2 degree target. And it’s not only a lack of ambition that make the UN talks, or what some have dubbed the ‘Conference of Polluters’, a failure- it is the whole framework of market based mechanisms and carbon accounting it has adopted as ‘solutions. New markets are being created which do little to nothing to help prevent climate change, but do help Government’s appear to be doing something, and help create new profit. The REDD+ scheme, born out of these negotiations, is basically a new industry where people can be paid for not chopping or burning down forests. In some cases, such as in Mexico and Brazil, indigenous peoples who make their livelihoods and also live off the resources in these forests, sustainably, are having their access to their lands cut off as these forests are affectively privatized for the new carbon economy. Not only this, but rich countries get to buy credits from this programme to allow them to keep emitting. And this is just one example of such a project, there are many; and while even many environmental NGOs accept these solutions, resistance to them is being led by indigenous groups, peasant farmers like the group La Via Campesina, and women of the global south. Given vested interests in the current economic system, Paris will fail. But we can find power and solutions elsewhere and we believe that’s where we should put our collective energy. In this context Oil Free Wellington has decided to organize two events to strengthen what has been working to address climate change: local grassroots resistance to fossil fuels and the growth of a climate justice approach that makes links across progressive movements. For instance local people have been successfully resisting fossil fuel expansion in the US – stopping hundreds of new coal-fired plants; in Canada – delaying pipeline construction; and in South America where indigenous peoples are resisting fossil fuel expansion into forests. Specifically we want to deepen understanding of the structural causes of climate change and the big picture solutions; make stronger links between diverse groups; and build capacity for and commitment to direct action. Change Everything will take place on the weekend of the 12th and 13th December, at the end of the Paris talks. The gathering on the Saturday will involve plenary sessions on capitalism, colonialism and the climate, as well as peoples’ solutions to climate change. The afternoon will involve participatory workshops exploring radical solutions in more depth. Registration will go live at the start of November. On December 13th we take action. We will take to the water for Wellington’s largest ever on-water demonstration and practice blockade for resistance to fossil fuels this Summer. At this point no one knows for sure when the oil industry will show up this Summer but it is likely they will again, for surveying off Wellington’s coast. We’ll have a large number of kayaks and paddleboards available for people to use and action on the land too. Regardless of what is agreed to, it will be more important than ever that we empower each other to work for climate justice from the ground up. Let’s look elsewhere for power and action, let’s look within and across our communities and struggles. If you have your own water-going vessel, be it a kayak, paddleboard, yacht, jetski, barge, speedboat or pirate raft, bring it along. Email us at oilfreewellington@gmail.com to let us know you can bring your own vessel. We’ll need other help on the day too so let us know if you want to help out. We have a Give a Little page to cover the costs of boat hire. https://givealittle.co.nz/cause/changeeverything. We’re interested in forging new relationships and networks with others wanting to work towards climate justice with a critique of capitalism and false solutions, and in a way that empowers communities and builds resilience. Get in touch.